This is now a crisis – the rules that traditionally have preserved governments are out of the window. The prime minister has been defeated again. Her authority – if not all gone – is in shreds. But for Number 10 there’s an opportunity too, because MPs will soon be presented with a new choice – back the PM’s deal, which has already been defeated twice, or accept the chance of a delay to Brexit. This isn’t the choice of a government that’s in control. But the tactic is to make the best of chaos. To use nerves among Brexiteers to shove them towards accepting Theresa May’s deal in the absence of another solution with no other agreed alternative – yet. The prime minister is beginning another day not sure of where it will end. 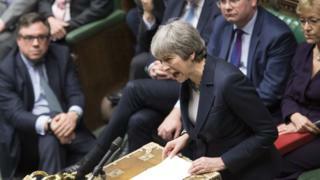 MPs are bristling to push their own different solutions – none of which she or Parliament as a whole, let alone the public, is ready to accept. Yet even if this pandemonium strangely leads the way to order, to a smooth departure from the European Union, there’s a different question: could a functioning administration ever again exist under the present cast? Police deny claims it is Indonesian maid, Adelina.